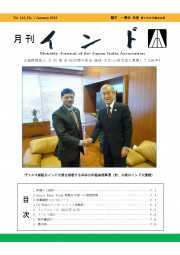 Established in 1903, the Japan-India Association has been working for development of the Japan-India relations as a Public Interest Incorporated Foundation. Deepening friendship and promoting mutual economic interests, Japan was headed by Messrs. Viscount Moriyoshi Nagaoka, Marquis Shigenobu Ohkuma, Viscount Eiichi Shibusawa, when JIA was inaugurated in 1903. Japan and India have been enjoying most friendly relations for the last decades. Recent examples of mutual relations with India. The Emperor Akihito and the Empress Michiko have visited India from Nov. 30 to Dec.5，2013 The Prime Minister of India, H.E.Dr. Manmohan Singh gave a lecture on Japan- India relations to Japanese nationals at Hotel Okura, Tokyo on 28th May, 2013. The Prime Ministers of Japan and India are visiting reciprocally every year to exchange views on various matters. 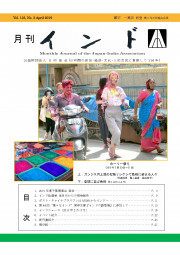 Once join to JIA, you will receive ten copies of monthly magazine “Gekkan Indo” every year. 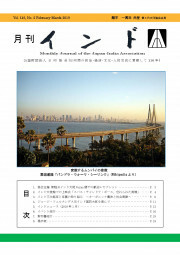 This magazine contains topical story of the time as main article, Japan-India relations and India related events in Japan, etc. You will not miss information on India after joining to JIA. * For membership from abroad, please contact directly to the Secretariat.